It’s easy to spend money and not go hunting. I once came across an interesting character who used to put in for Los Banos Wildlife Area in the waterfowl lottery. One weekend he was drawn and arrived three days early so he could be first in line for the Saturday hunt. He got the space blind he wanted, but quit hunting at 8 AM so he could get back to the parking lot in time to be number one for the Sunday hunt. You don’t have to spend a lot of money to kill a nice bull elk. 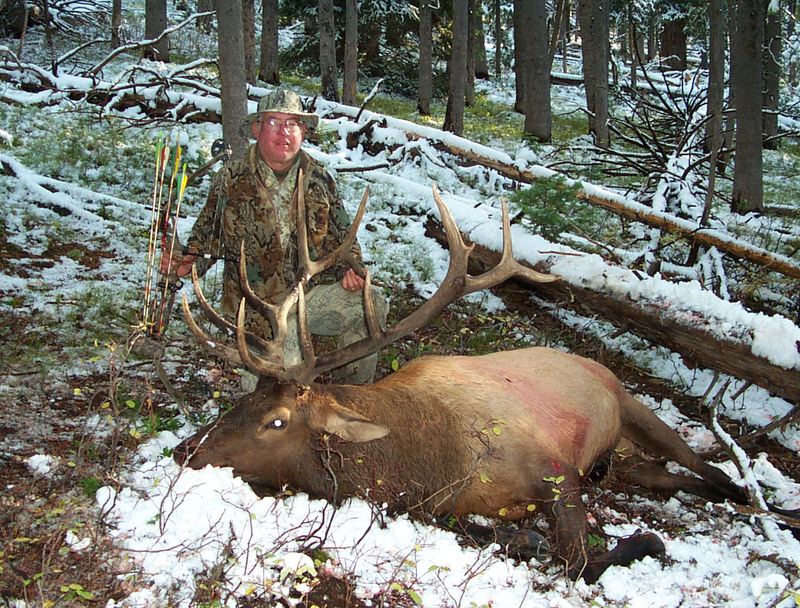 Rob arrowed this one in 2004 and tagged it with an Idaho over the counter tag. For this year, at least, I’m back to hoping for a tag. Hoping is not as good as just flat-out buying in terms of ease of planning and satisfaction with the result. I’m not really into gambling, so the process of gaming for a tag is a real drag. I do it every year anyway. Of course there are still some over-the-counter options and we’ll be using that one this fall by purchasing archery elk and general deer tags in Idaho. We’ll be hunting in a group of four during September. I’ve also purchased an A-Zone tag and preference point with my first CA deer tag. Next year we should have enough preference to hunt a California X zone. These things are good. 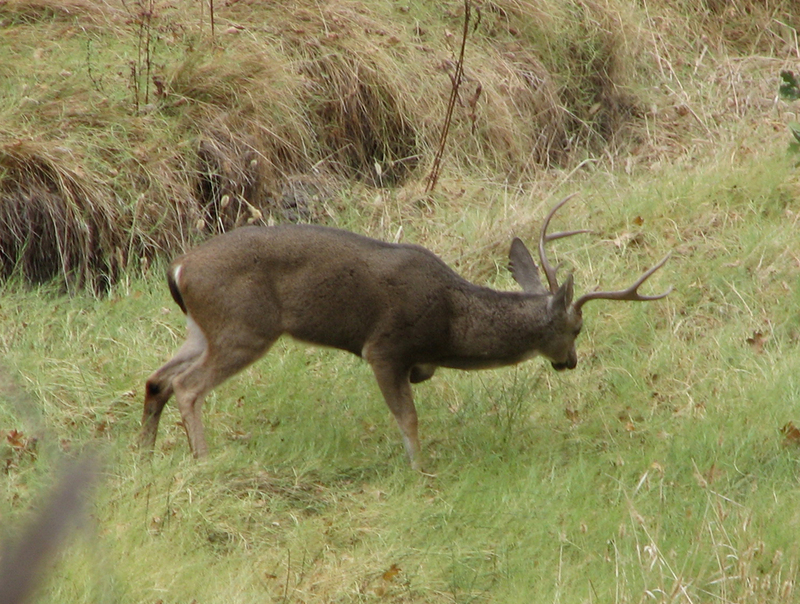 This is a typical A-zone blacktail. I'll try to arrow one of these on our ranch. However, gaming for a high value tag is not looking good in California this year. I have eight preference points for Antelope, Elk and Sheep this year. Eight is one less than the maximum, so I’m in the 20% that have to get extra lucky and the odds are very poor. In most cases, even the holders of nine points will need luck – especially in the sheep category and they have a chance for 100% of the available tags. 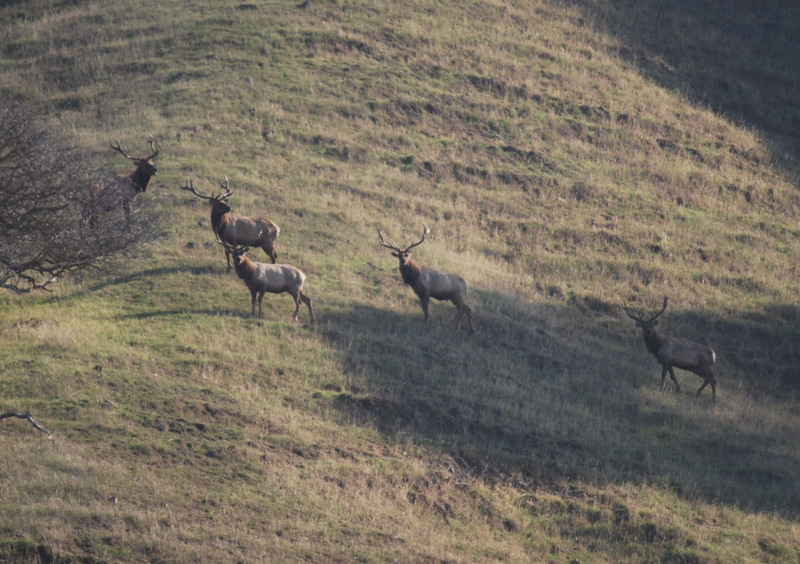 California has three species of elk, but it takes a lot of luck or money to hunt them. I photographed these Roosevelt elk while on a blacktail hunt near the Marble Mountain Wilderness. I’ve never had much luck in draws, but I drew an archery antelope tag one year and an Anderson Flat archery deer tag another year. Didn’t bring home any venison, but I did have the opportunity. A quick look at my California odds shows that I have a less than 1 in 450 chance of drawing an antelope, elk or sheep tag combined. That’s a chance, but not much of a chance. That’s at a cost of $24.39 for 1/450th which comes out to $10,975.50 for a 100% chance. If I hunt until the age of 81 (unlikely), my remaining lifetime chance is 20/450 or 1 in 22.5. Doesn’t look good for hunting elk, antelope or sheep in CA unless I spend the money to purchase a tag. In Nevada, I’ve been buying bonus points for several years. I currently have three points, which means I may get lucky on a deer, elk, antelope, sheep or goat tag. My chance of drawing an archery mule deer tag alone is almost 50% and when that is combined with the other four choices I selected, two rifle and two muzzleloader hunts, the mathematical odds are that I’ll get some kind of tag, but it’s not for sure. For antelope, I put in for an archery tag that has a high percentage chance of drawing, so I may get that one. I didn’t calculate the odds for elk, sheep and goat, but they are very low. 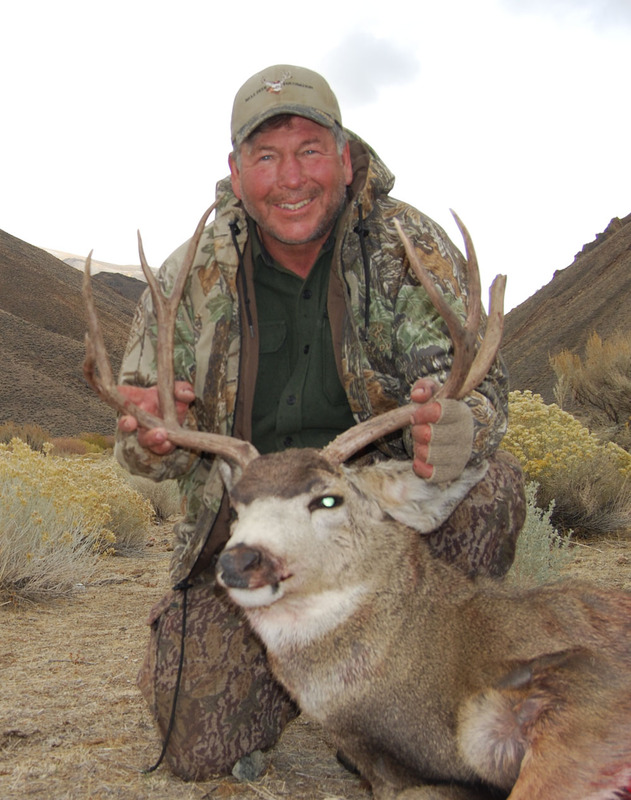 I paid $4,500 for a Nevada landowner tag the year I shot this buck. I think the prices are down slightly now. In Colorado, I opted to purchase only preference points for deer, antelope and elk. One of these days I’ll have to get serious and put in for an actual hunt. The cost of the preference points for three species came out to $25. I have seven points for elk and antelope – about five for deer. That comes to about $200 over the past seven years. I hunted twice for deer with my bow. For the third year in a row I entered the Utah lottery for tags at the Wildlife Conservation and Hunting Expo in Salt Lake City. The hunts offered looked good, but by the time I purchased a Utah hunting license and paid for the chances, it added up to about $250. It would be worth it if I got drawn once, but so far I haven’t had a sniff. That’s $750 invested over the last three years. Finally I purchased five chances for the California Open Zone tag for $27 and two chances for a Owens Valley tule elk tag at $10.80. All together I spent about $558 for these draws. That’s a lot cheaper than $10,000 for a Nevada landowner elk tag, or maybe it’s not? 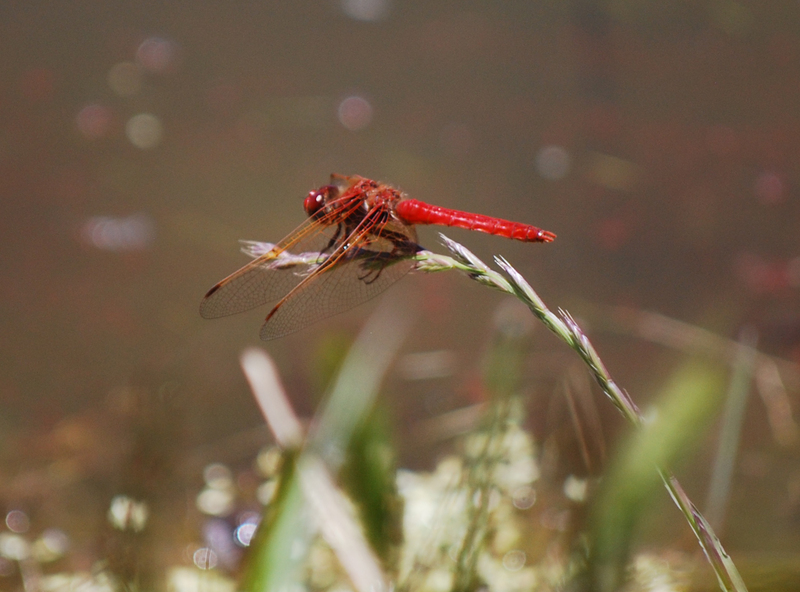 Over the years, I’ve noticed a pure red dragonfly at our ranch ponds. It’s so colorful, that with camera in hand, you must attempt to photograph it. 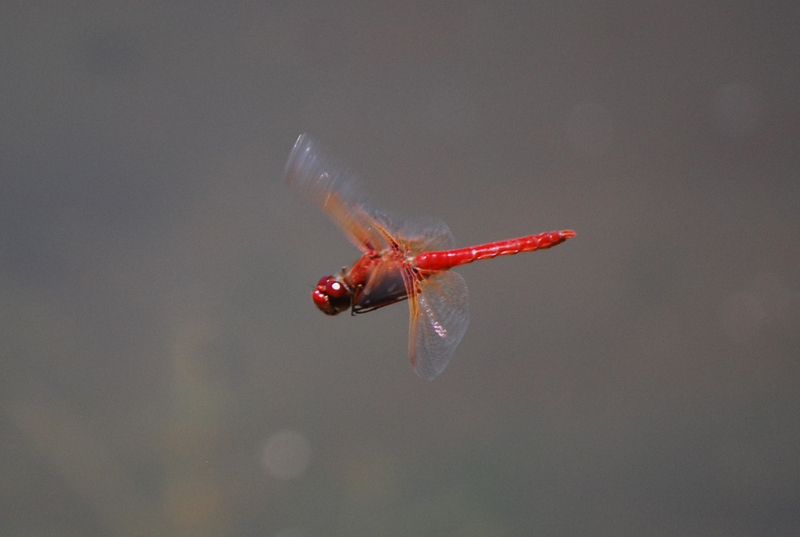 Yesterday, I sat by one of our ponds, photographing pond life and the red dragonfly appeared. I was lucky enough to get a couple good photos. Curious about the name of this dragonfly, I looked for it on the net. The only red dragonflies I could find were not local. Here it is. This spectacular red dragonfly is common on our ranch. Here it is on a perch. Sometimes insects are ugly, but not always. Last week we were out in the Altamont and came upon a pair of Swainson’s hawks. From nearly a half mile away, I snapped a few photos with my 200mm Nikon lens. They came out OK, so here they are. 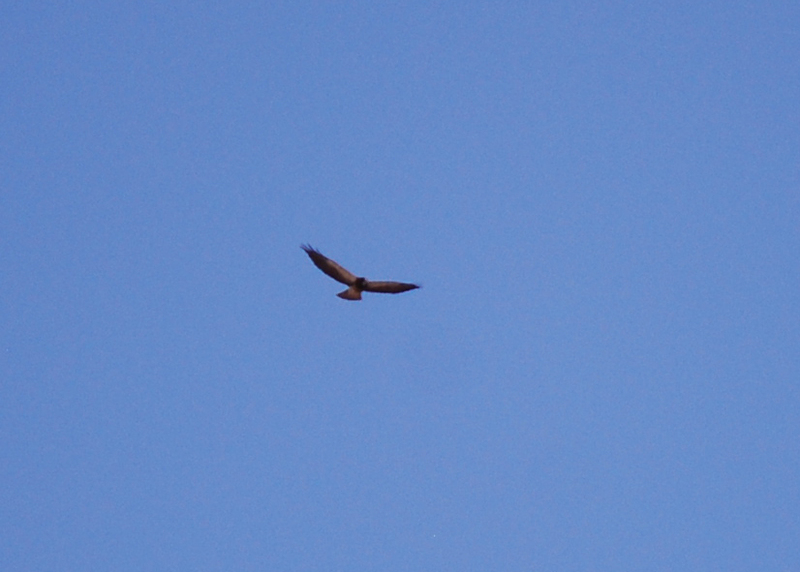 You can see the charactaristics of the Swainson’s hawk quite well. 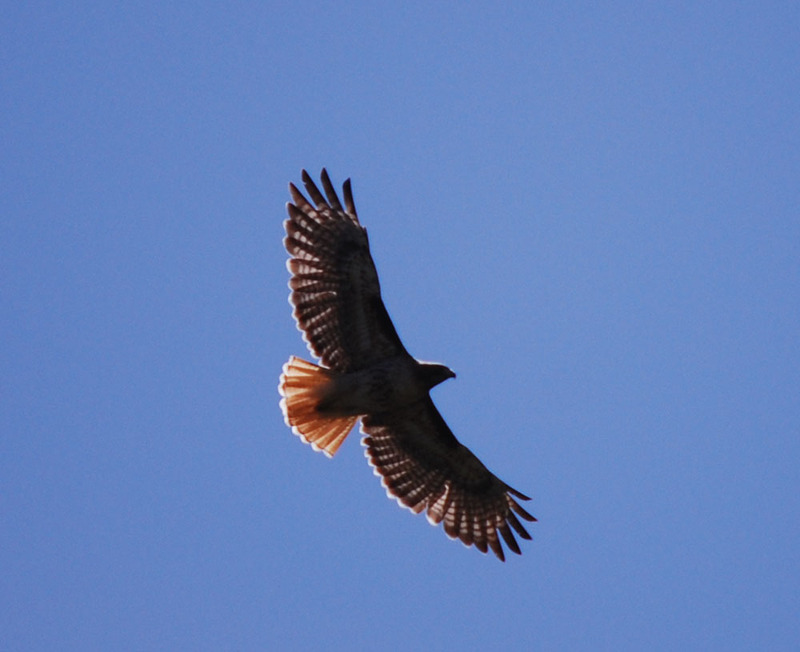 For comparison purposes, here’s a redtail photo from my files. 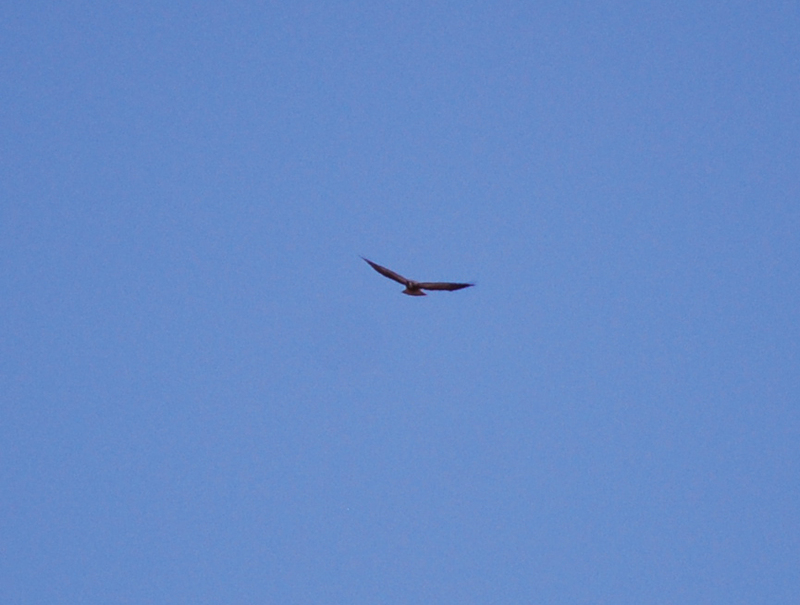 Redtails are the most common buteo in our area. Spike Schau and the Warrior Watch riders put together a great motorcade. 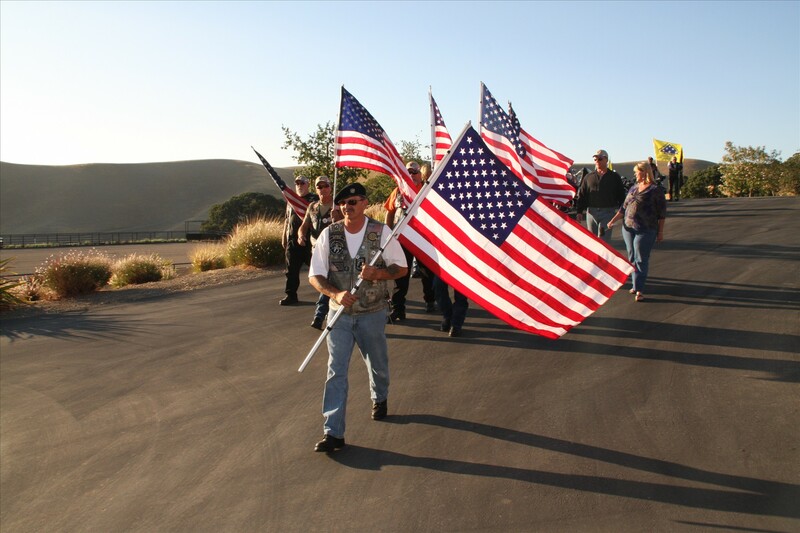 Opening festivities will begin on Thursday August 18, 2011 with a motorcade through Pleasanton-Livermore and a barbecue at the Rao Ranch. The hunters will go afield starting on Friday August 19th. Dan Hammack will lead the soldiers once again this year. 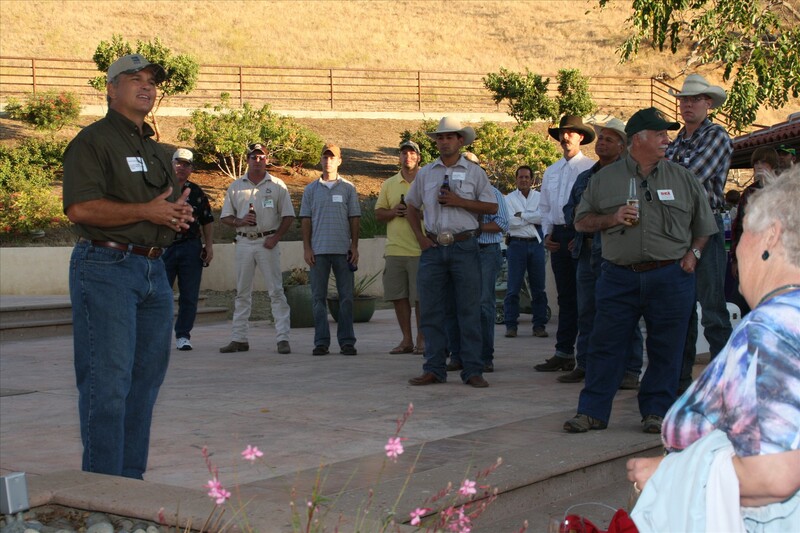 Here he addresses the crowd at the 2010 BBQ. How do I know this is a fat sow? 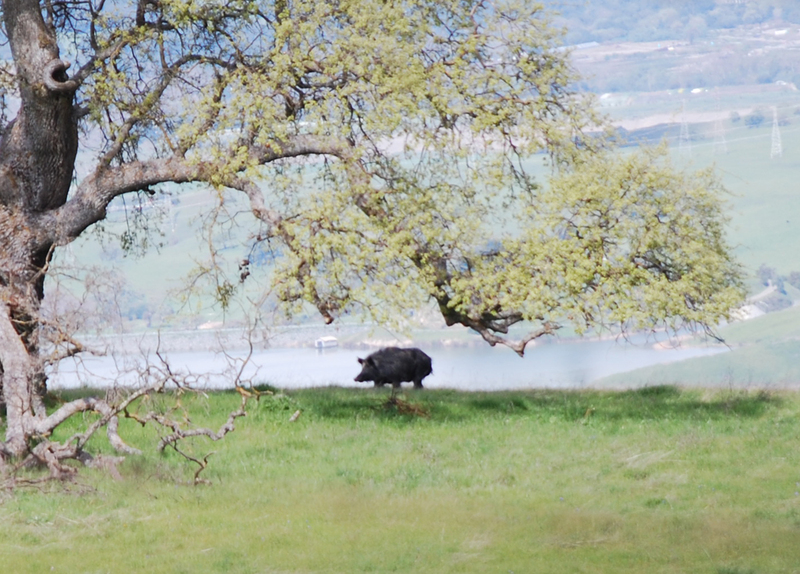 I’ve had hunters kill a pig like this one, but they are uncommon around Livermore. Wild pigs seldom get excessively fat, but apparently the great grass year has provided well for this pig. My guess is that this pig weighs almost 300 pounds. 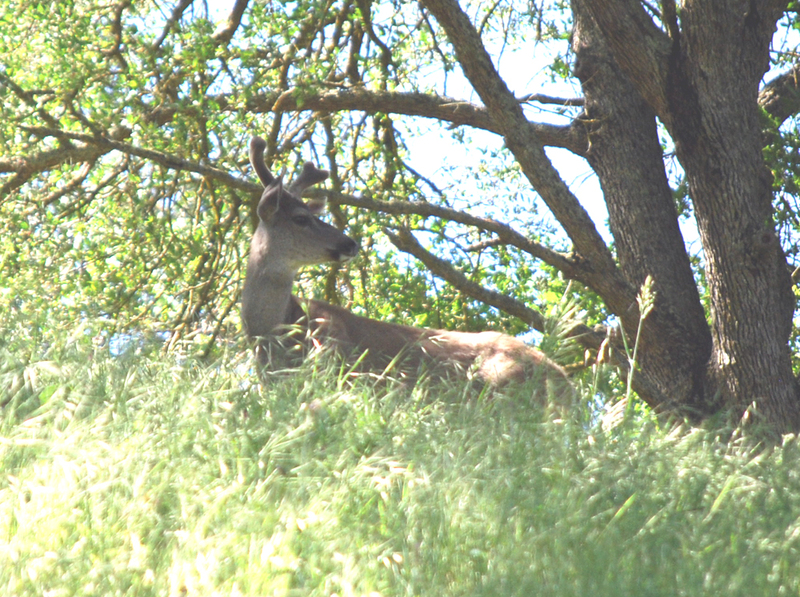 She was about 250 yards away when I snapped this photo (a couple of weeks ago). Her bulbous body makes her head look small and she looks like she’s filled with helium. When we slaughtered the fat pig I mentioned, it was loaded with extra fat. It’s also possible that this pig is pregnant and full of piglets almost ready to be born. My pocket knife is 3 1/2 inches long, about the length of this track. This is not a large lion or a small one either. The ground is soft, which is why the track shows at all. 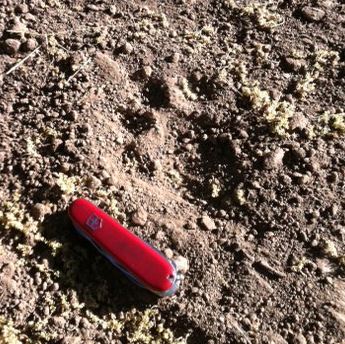 On hard ground one seldom spots lion tracks. This lion track was found on a road that also held many deer tracks. Where there are deer, lions will follow. Bucks are growing their antlers. One of the benefits of predators is that they move their prey species around, protecting flora from overgrazing. While visiting at Discovery Bay, we noticed a pair of bass near shore, beside my brother-in-law’s deck. 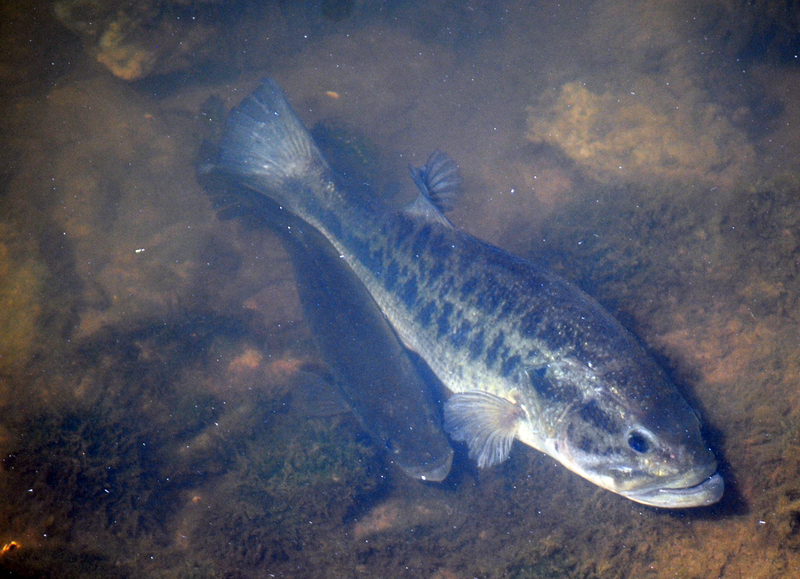 We stood about fifteen feet above the bass and watched as they spawned. The male is the smaller of the two fish. We guessed his size at about three and a half pounds. The female was much larger. The male manuvered around the female, nudging her and occasionally getting her on her side, which produced a better view. The males was quite active. 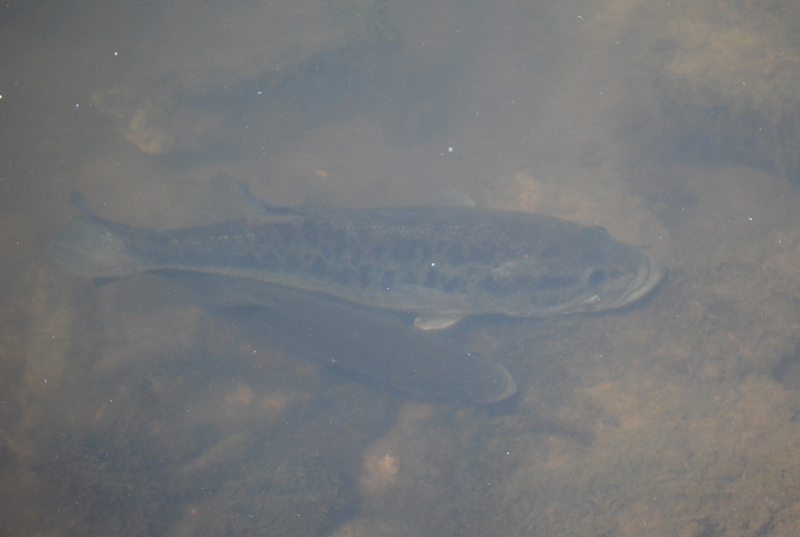 With my photo program, I adjusted the photos and the fish are easier to see. The larger female was also more colorful. You can see that the rocks behind the fish are cleared of growth. The area forms the nest where the eggs are laid. The fish will defend the nest. It will be interesting to watch to see how things progress over the next couple weeks.